StarWind Software keeps updating its product line and especially their flagship product StarWind VSAN. A new release for VMware vSphere has been released a few days back. This release is only a maintenance release, but worth to note some performance improvements and Linux Kernel updates. Some of our readers might remember being StarWind as a Windows platform only. Things have changed and now StarWind supports Linux virtual appliance which you can easily deploy in VMware vSphere infrastructure. StarWind basically has a ready-to-go Linux VM installs on the cluster nodes to share their storage resources. Once installed, Virtual SAN creates a fault-tolerant storage pool available to the entire vSphere cluster. Along with the trial download, you'll get a detailed PDF which will walk you through step-by-step, so we won't repeat it here. However, later in this post, we will recap some fundamentals from StarWind and also show you some screenshots from the lab where we have done the deployment. What's New in StarWind VSAN for VMware vSphere? This release of v8, build 12859 has brought only minor updates, and some bug fixes. Download the fresh StarWind VSAN for vSphere build at the following link – StarWind VSAN Trial Download. If you're upgrading, the update procedure is here. The deployment guide is very detailed and really good. All you need to do is just follow these steps. 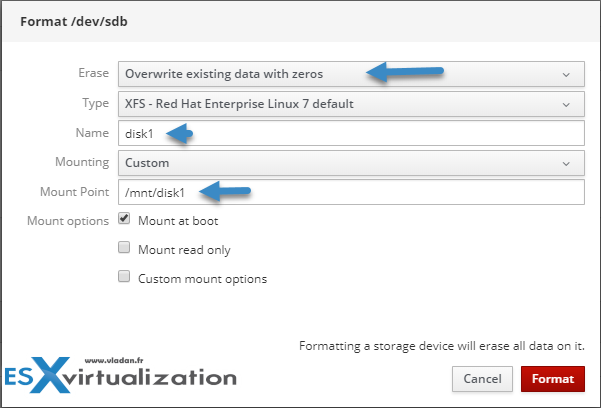 Screenshot from the lab showing a moment where after added a data disk to my StarWind VM, through the management UI I'm able to format and mount the second disk. While you can start with DHCP, it’s best to login to the console and assign a static IP. (The included PDF has recommended that and includes that step). Note: the connection port is 9090, so after deployment, make sure to connect via this port. Here is an overview of the web-based login screen. If you’re planning to use it in production, please check with StarWind for the latest details, tweaks, and recommendations. StarWind Virtual SAN Free – remains an SDS solution that serves the production, POC (Proof of Concept), or test and development purposes completely for free. StarWind VSAN Free provides an ample set of virtualization tools for admins, developers, and IT geeks who have the skills necessary to maintain virtualization infrastructures using only CLI. At the same time, it becomes even more appealing for vSphere users. Now, VSAN Free turns into an SDS stack with a Management UI, unrestricted features, unbounded capacity, and unrestricted production use. 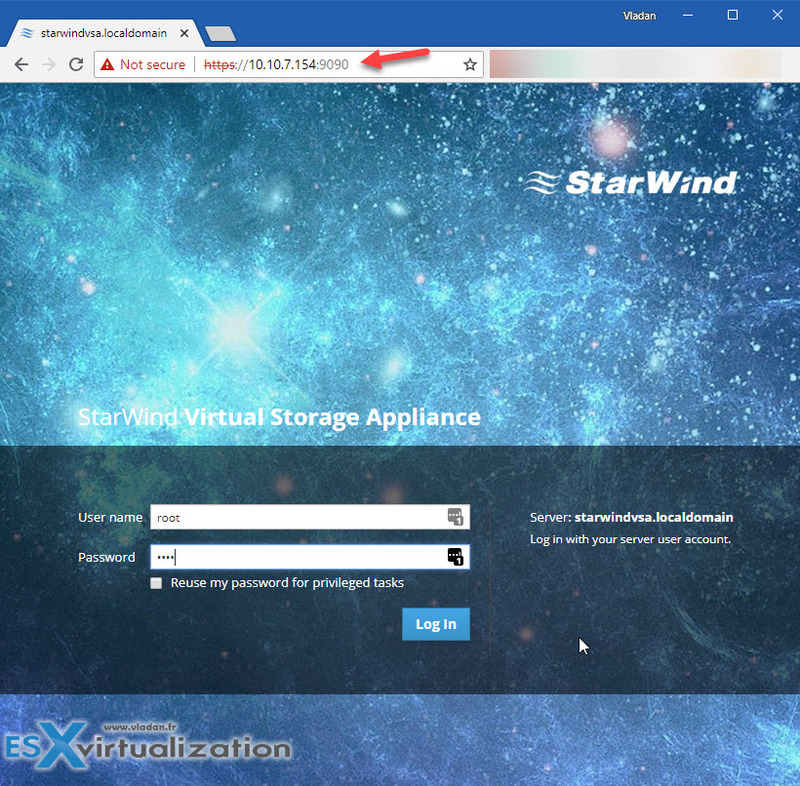 StarWind Virtual SAN product page. There is a detailed configuration guide for vSphere, Hyper-V but also KVM. StarWind Virtual Storage Appliance is a very simple and easy-to-deploy solution. The fact that it does not need Windows for the underlying OS is certainly good news for VMware users willing to create an easy solution without additional spend on Microsoft licensing. With just two nodes you’re able to create highly-available storage which uses the local disks (DAS) of each server and creates a pooled storage exposed as an iSCSI storage visible by all hosts within the cluster. What is a VMware Cluster?